Facebook Messenger chatbots are a hot topic. Everybody is jumping on the bandwagon: conversational marketing is the phrase of the moment. 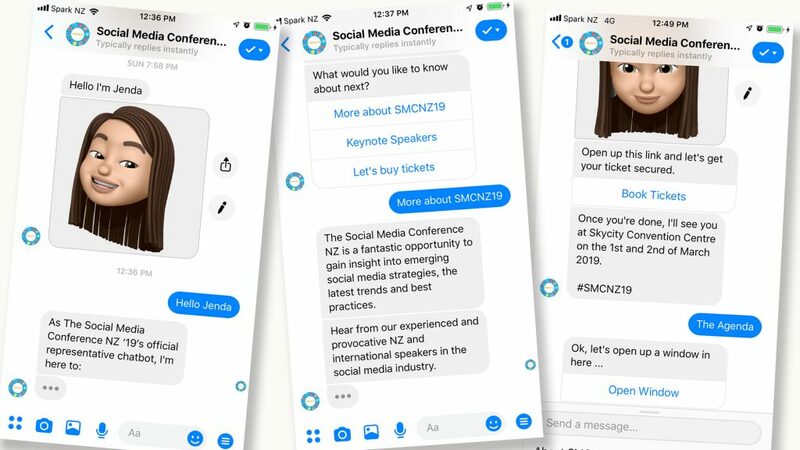 At Conversologie, chatbots have been on our checklist for some years; and late 2018 when the effervescent Wanita Zoghby-Fourie was planning New Zealand’s high-profile social media conference, #SMCNZ19, we saw a chance to try our hand at something a little different. A chatbot – yes, but one with, quite literally, an agenda. The plan: a first phase chatbot to educate would-be conference attendees and guide them through the process of buying tickets. Followed by the second phase, a virtual MC who would announce upcoming sessions, direct people to breakout rooms and topics, even give directions to the bathrooms, and seek feedback on the speakers. Sometime between Christmas and New Year’s Eve 2018, the scope and function of the Social Media Conference chatbot were solidified, along with the foundations of personality. The bot was christened “Jenda,” hinging, rather unoriginally, on her intended function of delivering the conference agenda (why not? Tenancy Services have “Nancy” and Auckland Airport has “Ava”) – and the process of designing her conversation flow began. The first step in bot flow mapping is objectives-based: what goals do we need to achieve, and how can we do it efficiently and quickly within the restrictions of the platform? The second step is about the user experience – what do they want to know, and how can they interact with the bot? While AI bots can arguably deal with more personalised and complex user interactions, they are also exponentially harder in terms of design and detail, and take much more work in terms of fine tuning. Jenda’s brief was none of that. She was to be low-budget, the kind a small business would typically install. In keeping with this, Jenda’s personality (and look) was built around Wanita herself – upbeat, professional, charismatic, passionate. As we have previously discussed, personality is an essential part of chatbot engagement, and in the case of smaller business bots, the smartest move is often to make the bot a reflection of the business owner herself. Phase One Jenda was a relatively quick and painless build, offering a few benefits of the conference and top-lining the keynote speakers, integrating pages from the conference website. Phase Two was a different challenge entirely. 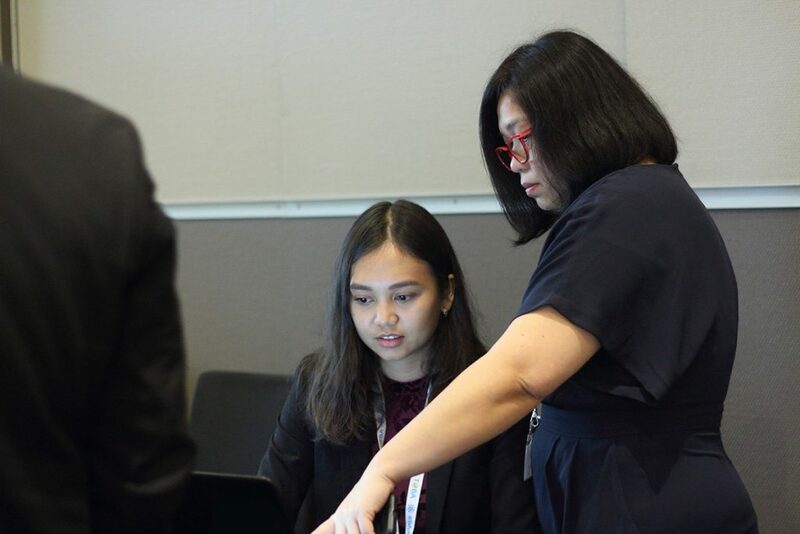 In real-time, minute by minute, during the course of the two-day event, Jenda would have to coordinate and guide all of the conference’s attendees via her Messenger announcements. And all this, based on an agenda that was still being adjusted even as we were creating the flow. Planning consideration: each timed announcement had to be independent of any user interaction, and not rely on completing a prior sequence to proceed. Solution: combined with scripted chatbot flows, we designed a series of Facebook Messenger broadcasts. The trick would be to avoid triggering Facebook’s protective algorithms: the moment the platform interpreted Jenda’s messages as spammy or too frequent, it could suspend or shut down the SMCNZ19 page. The build itself was a frantic effort in the two weeks before the conference, adjusting conversation flows and timings, setting up carousels (and changing them around) for the speakers and topics, creating and assigning tags for collating and filtering data afterwards, among many other things. Crafting Jenda’s personality was important, too. Was she saying too much? Too little? Trying too hard to be funny, or sassy – or not trying hard enough? Our position to date had been that a bot’s personality was as important as its function, if not more so. Would that view be supported by the post-analysis? Would personality even matter? After creating the flow, it was a case of checking, re-checking – and crossing fingers. The number of broadcasts and their timings meant that a full, real-time test of both days in advance was not viable. In other words, this would be a build-it-launch-it sink-or-swim effort. Needless to say, we on the Conversologie team had a restless night before Conference Day. All too soon, March rolled around and the first day of Conference was under way. For the team, it meant an early start – joining the registration table and walking new arrivals through the process of subscribing to Jenda. The easiest way to process subscriptions was with Messenger’s own scan code; possibly one of the Facebook platform’s better-kept secrets. True enough, despite being invested in social media, surprisingly few of the attendees were familiar with how to scan Messenger code and start a bot flow. Nearly everyone, though, was successfully able to connect and subscribe before the first broadcast went out. 8:55am. First scheduled broadcast sent successfully to more than 80 subscribers, gently reminding them to head to the main hall for the first speaker of the day – headlining keynote Park Howell. The team breathed a sigh of relief, and Jenda began her work for the day. Did it matter that attendees’ phones buzzed and lit up during the speaking sessions? Well, no: it was a social media conference, after all. Tweets, LinkedIn and Insta posts were encouraged with hashtags aplenty, so nobody was going to mind the audience checking their phones when Jenda’s next broadcast came in. The moment of truth had arrived. Jenda was working perfectly. But we knew not to underestimate the capacity of users to break our creation. Cue the typed responses, the unexpected questions, the default-reply dead-ends. Thankfully, very few – but there were enough to keep us busy. As quickly as we could, we made adjustments. Adding in new AI responses to give directions to the bathroom, how to connect to the wifi, validate parking, and where the beer was at. We were able to accommodate a last-minute change of breakout rooms when the venue’s equipment broke down; even adding in an extra broadcast on request. The most rewarding outcome, besides seeing Jenda deliver her messages on time, and seeing the responses come in to Messenger from users? Getting their direct feedback during the break times. By far the majority of people loved it – they enjoyed the chatter, they liked Jenda’s style, and they found the updates and reminders helpful. Negatives, there were a few; and they gave us valuable insights into what worked and what didn’t, what might prompt users to unsubscribe from a chatbot and what makes a conversation flow or broadcast more user-friendly. All in all, some fantastic learnings. A few days after the conference, we sent out a follow-up broadcast seeking further feedback on speakers, and, of course, on Jenda herself. The response was overwhelmingly a big thumbs-up. It was our own Chief Conversologist Jam Mayer who, as early as 2013, realised that email marketing was in decline and that the social media advertising platforms would undergo a transformation, as users shied away from ads that were irrelevant or annoying. Jam coined the term Conversologist, as a pioneering social marketer who understood that true business engagement comes from genuine dialogue – the two-way interaction, and not just advertising. 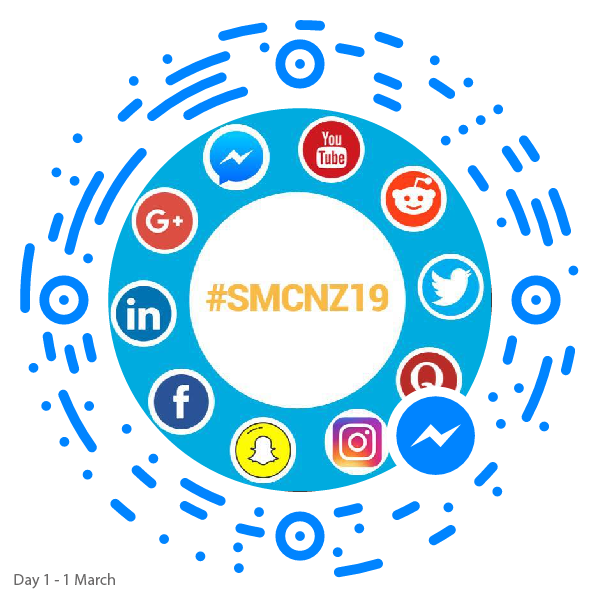 By all accounts the key to the SMCNZ19 chatbot’s success wasn’t just herfunctionality, which we had carefully planned to make the two days easy to navigate; it was also her personality. Memorable, likeable, engaging, and fun. 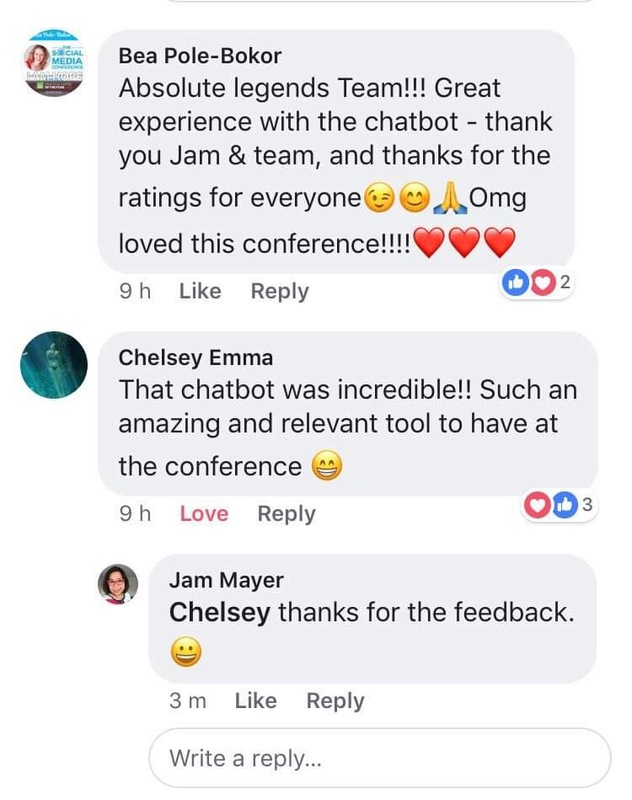 Here was proof of Jam Mayer’s conviction that, when it comes to representing a brand, personality and likeability are as important, if not more important for a chatbot, than its functionality. Glitches and hiccups were forgotten; the lasting impression was one of connection, and a smile. And we’re calling that a win for the Conversologist. From building a basic chatbot, through high-spec AI bots, to fine-tuning and adjusting, Conversologie offers a suite of chatbot services. Visit our bots page to check out the options.